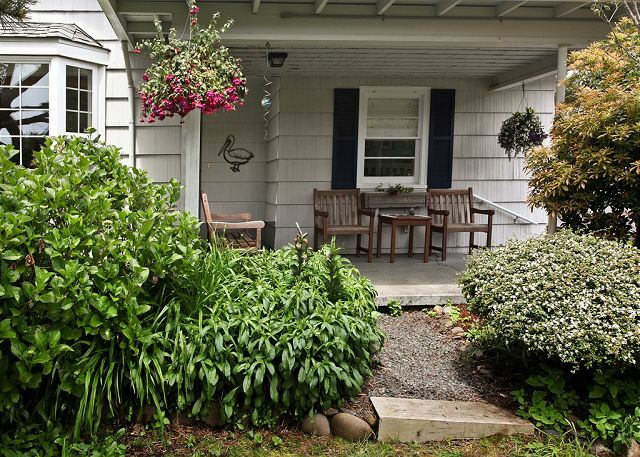 1/2 block to beach, Near Cannon Beach! Pet-friendly! 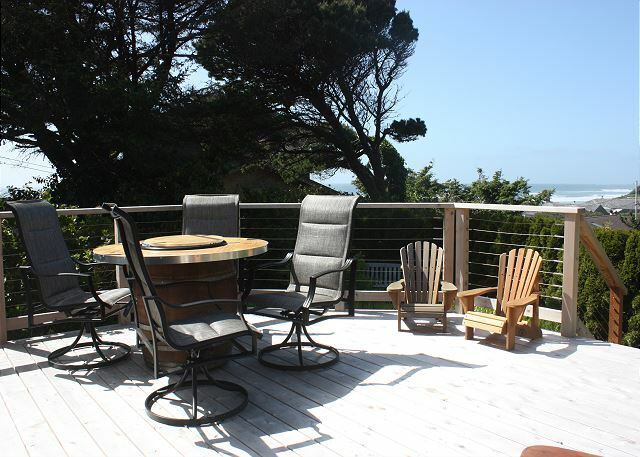 Deck with Ocean View! 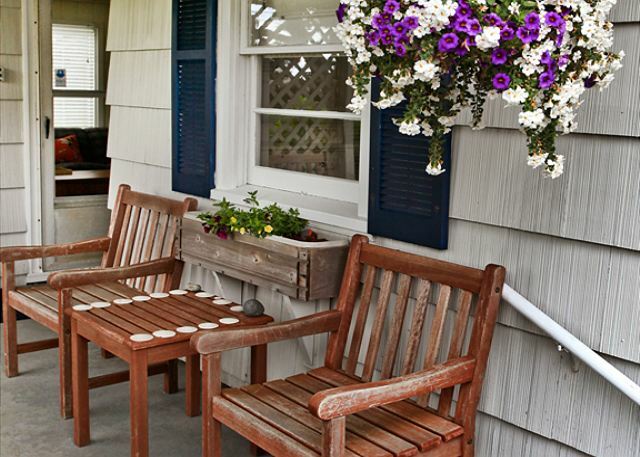 The cottage, comfortably furnished with “shabby chic” décor, can accommodate up to eight guests. 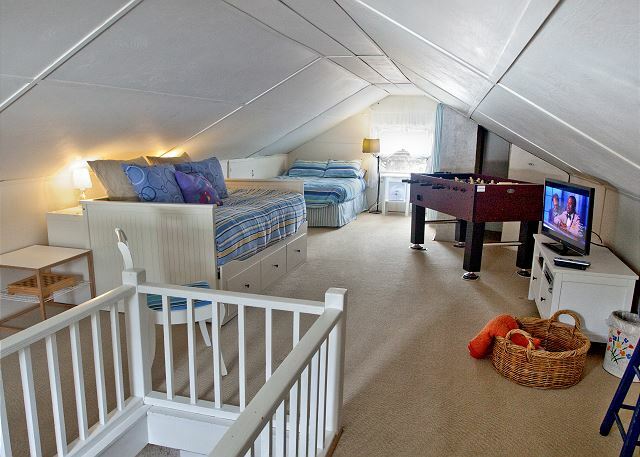 The main floor holds two bright, cheerful bedrooms, each with a queen bed wrapped in cozy comforters. 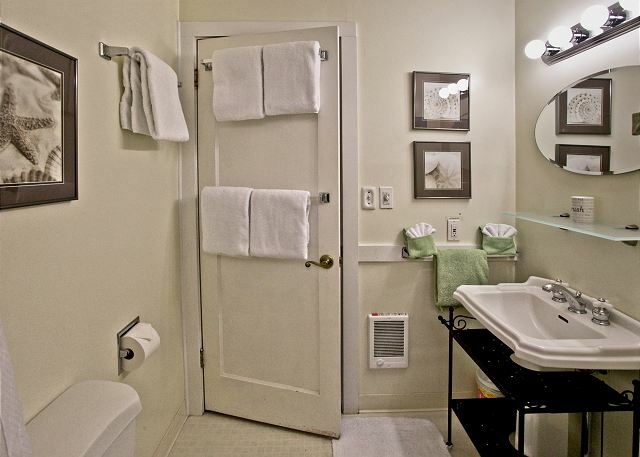 Also on the main floor is a full bathroom with tub/shower enclosure and plenty of plush towels and spa soaps. 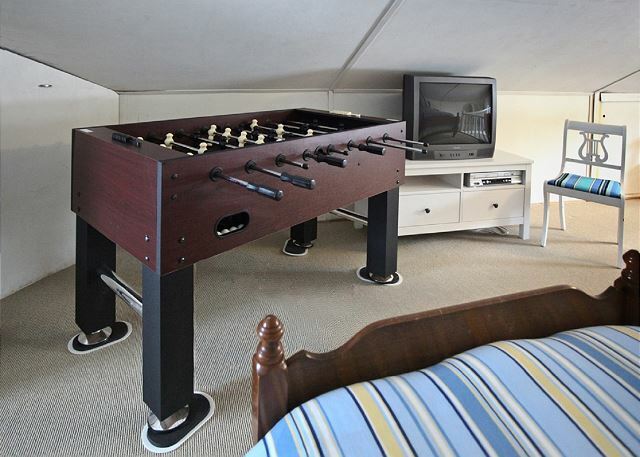 The large upstairs great room features two twin beds, a full-sized bed, television & DVD player, and a foosball table—a hip hangout for kids and teenagers. 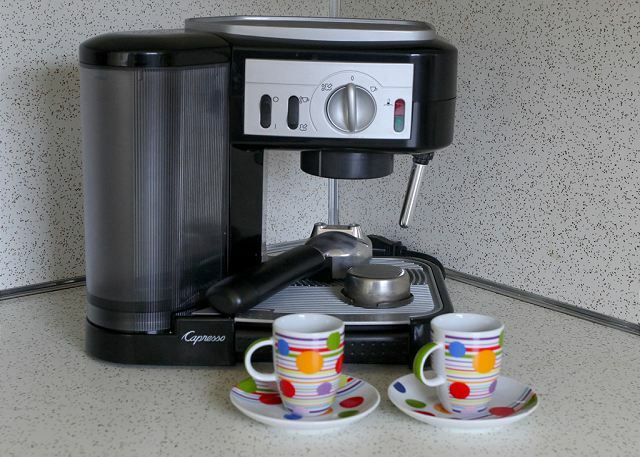 Coffee aficionados will appreciate the well-equipped kitchen’s stainless steel coffee maker and bean grinder. 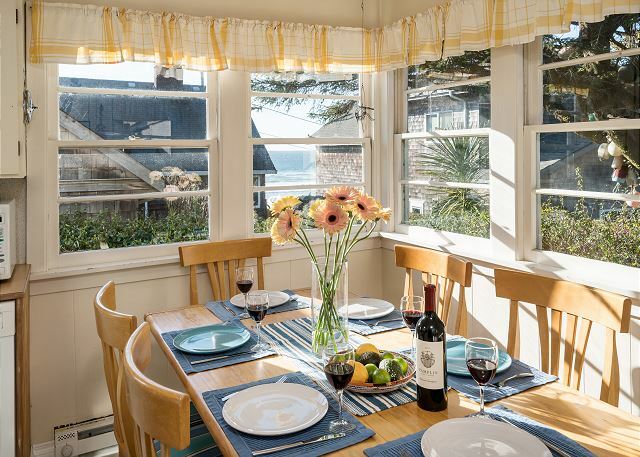 The dining room table is ideally situated for views of the ocean—the perfect backdrop for relaxing conversation and scrumptious meals. 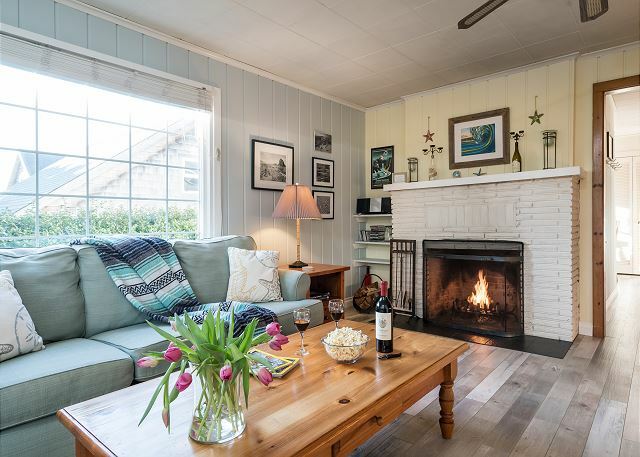 Curl up with a captivating novel in the warm and inviting living room or enjoy a movie on the cable-equipped flat-screen TV with a fire crackling in the wood-burning fireplace. You’ll find a large selection of books, family-friendly movies, games, and toys to enjoy. A Blu-ray player, VCR player, CD player with iPod doc, and free WiFi round out your entertainment options. 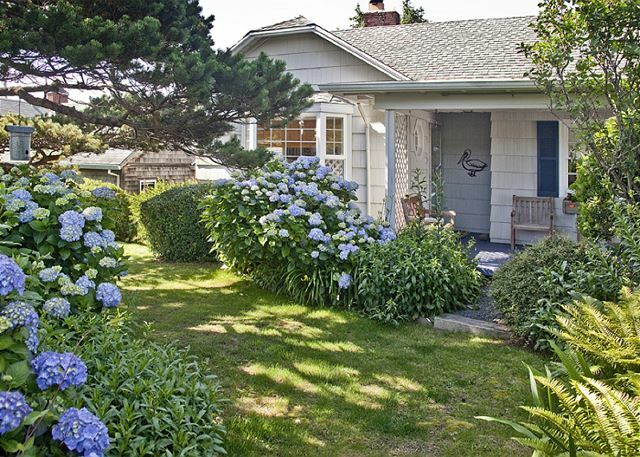 The yard, surrounded with lush greenery, mature trees, and beautiful hydrangeas, provides a quiet oasis for reading, sipping a glass of wine, and grilling on the gas barbeque. This home is also pet friendly. 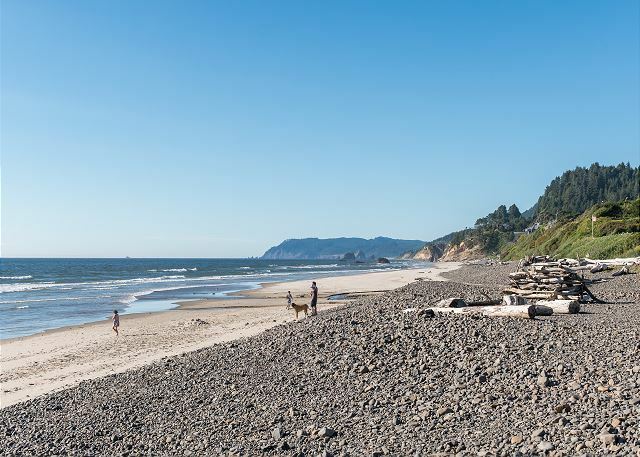 The secluded beach offers a dramatic playground for exploring tide pools full of sea life, surfing, boogie boarding, searching for seashell treasures, and building sandcastles. 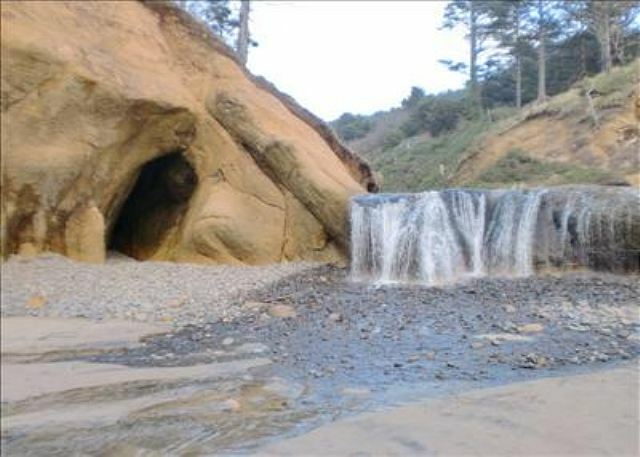 The stream that empties into the ocean nearby provides a sheltered setting for little ones to play in the sand and water. 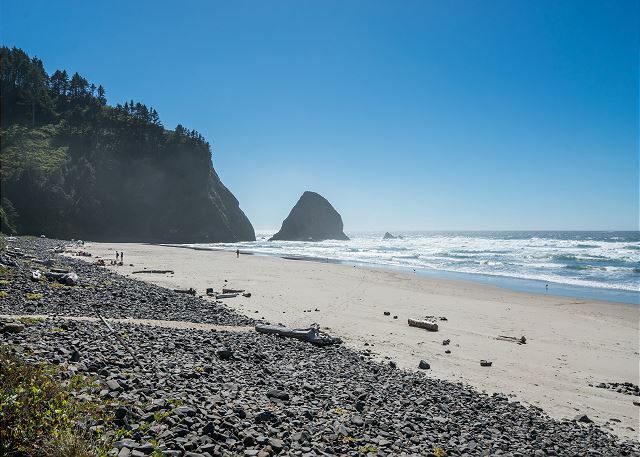 Hug Point, Ecola, and Oswald West State Parks, the Seaside Aquarium, and Haystack Rock are but a few of the attractions within a short distance from your doorstep. 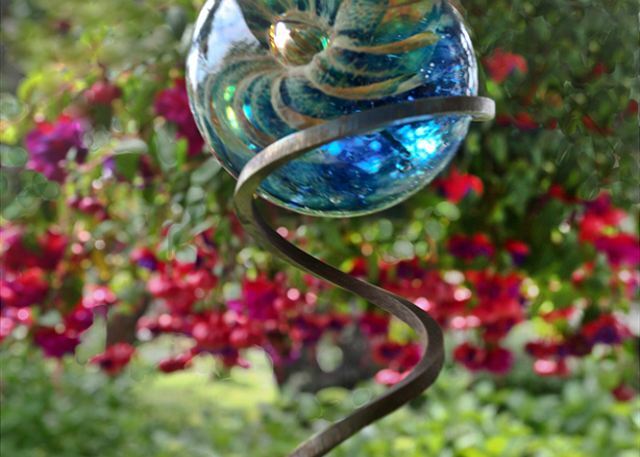 The seaside town of Cannon Beach offers renowned art galleries, fine dining, and chic boutiques just minutes away. 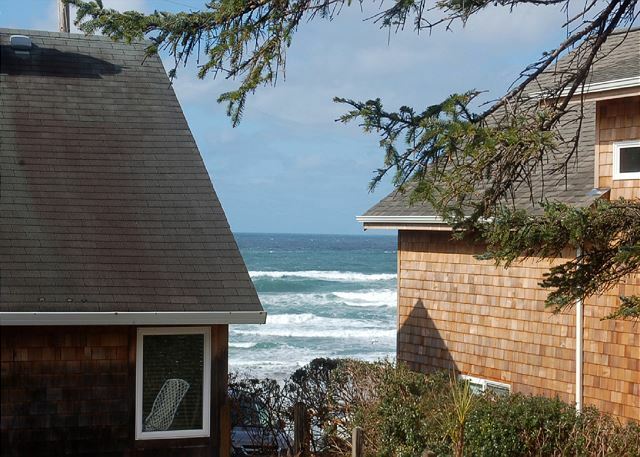 This warm and cozy home is sure to become your favorite Oregon Coast hideaway. The cottage was lovely and had everything you could need. What a great place. Had the feel of the coast from my childhood. Felt right at home the second we walked in. So close to the beach, it made for a great walk. Can't wait to go back to the same house. We had a fantastic experience at the Beach Bungalow. The house itself is cute and tidy. Four adults and multiple dogs were more than comfortable in the space. We barely used the upstairs except for a few rousing games of fooseball—yes, there’s a fooseball table, though the space would be perfect for families with kids. The location was exactly what we were looking for. Beach access is probably a four or five minute walk from the front door, and it’s well worth it for the breathtaking oceanfront view. And you have a view of the ocean from various windows as well as the back deck, which unfortunately we didn’t use much due to the weather. The Bungalow is situated close to a couple of great parks that are perfect for an afternoon stroll, especially with dogs. 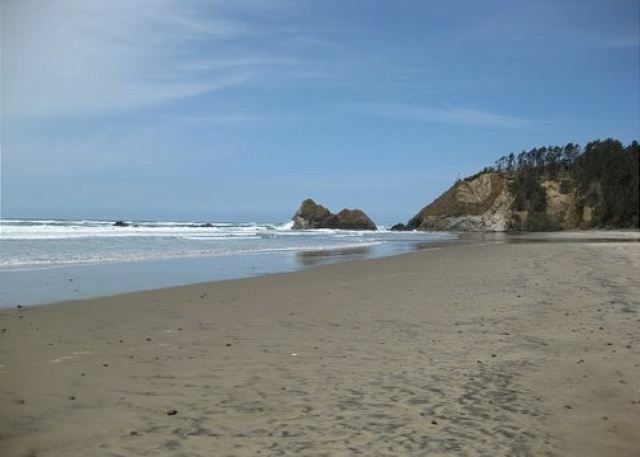 It’s far enough from the main Canon Beach area that you feel isolated, but also only eight or ten minutes from restaurants, bars, and shopping if you’re so inclined. Manager Response: Thank you for the fantastic review! 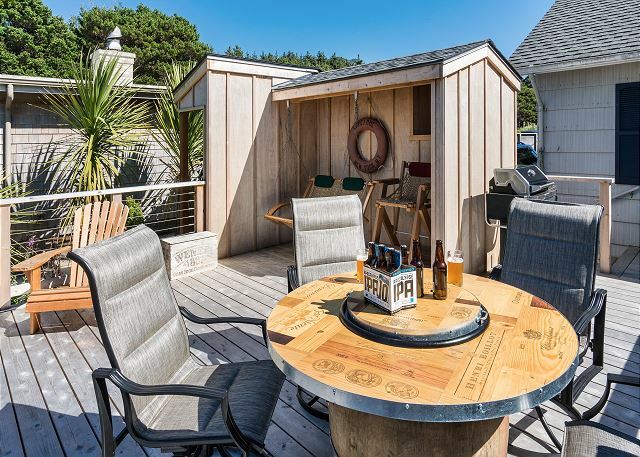 Beach Pines Bungalow is a unique home with incredible views, and we are delighted that it suited your group so perfectly. We had a good experience at Beach Pines Bungalow.. Very cozy cottage. 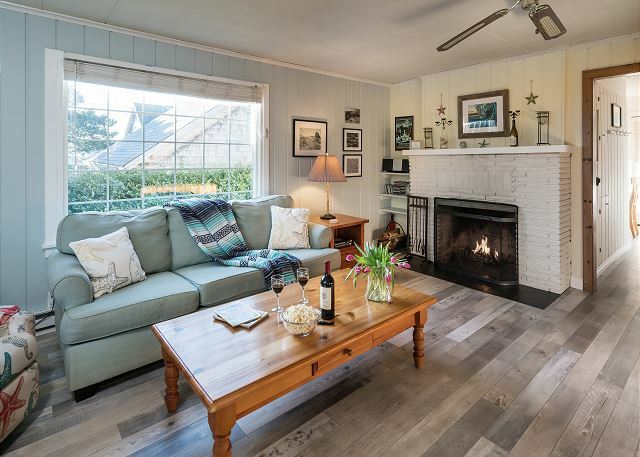 Loved the floors, and enjoyed the fireplace. Since warm weather was very scarce, it was nice to have an evening fire to keep it warm., and cozy. 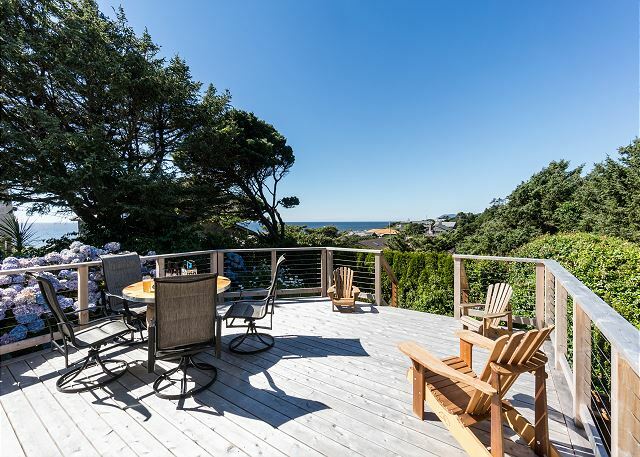 Great view of the ocean, esp from the deck. Manager Response: Thank you for the positive review! Total guest satisfaction is our top priority at Starfish Vacation Rentals and your review helps us to know we're achieving our goals. We’ve now visited this rental twice, in different times of the year. It’s extremely comfortable regardless of the weather. It’s nicely decorated and has great beds and a good shower. 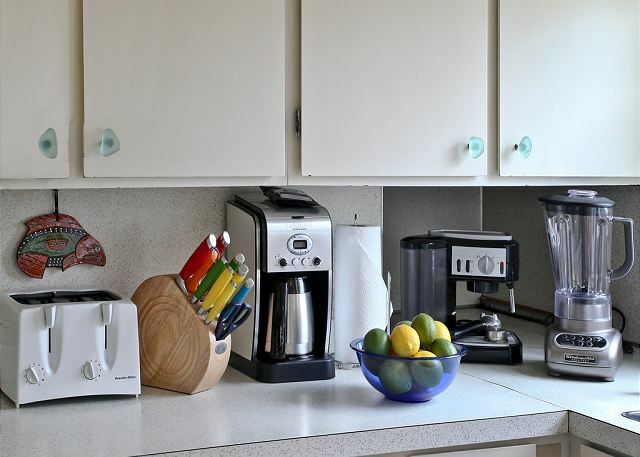 The kitchen has more than we’ve ever needed and we do cook and eat in. And the Starfish staff couldn’t be more pleasant to work with. It’s great in every way! Thank you for the welcome treats!! This house is next door to another we rented. The proximity was wonderful as our two houses were around the corner from one my siblings rented. 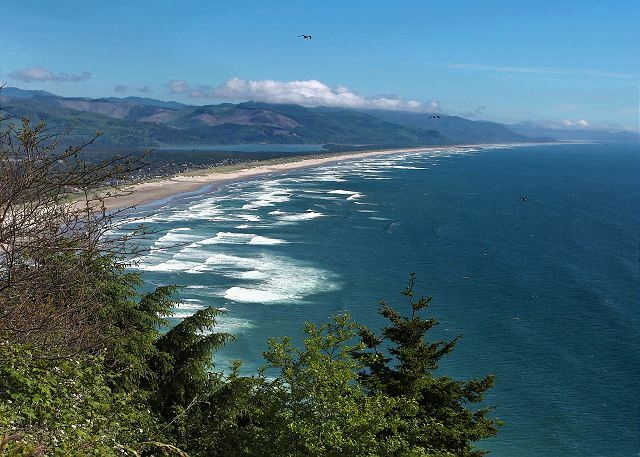 We love this area and have been coming to the Cannon Beach/Arch Cape area for decades. This was the perfect house for my family to enjoy a getaway. 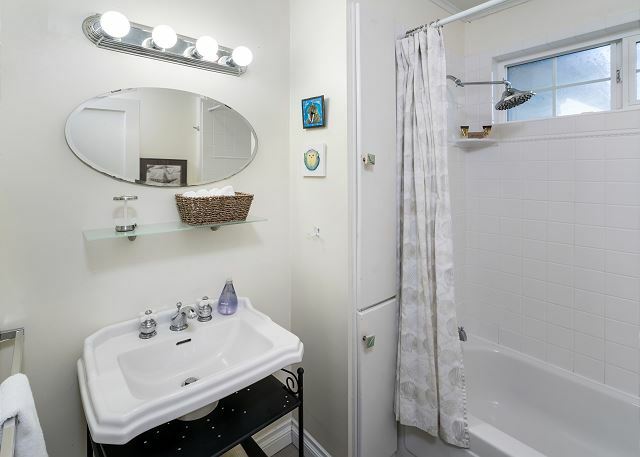 2 min walk to the beach, all modern amenities and the couple questions we had were answered very very quickly. 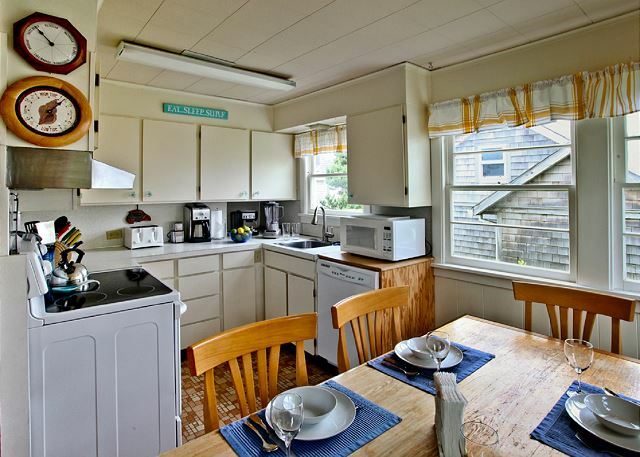 This little beach cottage had everything we needed to make our stay enjoyable. Although we were there during the off season, the fireplace and movies allowed us to settle in after a full day of hiking. The beds were extremely comfortable and equipped with extra bedding for the cool evenings. We will definitely be back. We brought family and friends with us to Arch Cape this year. 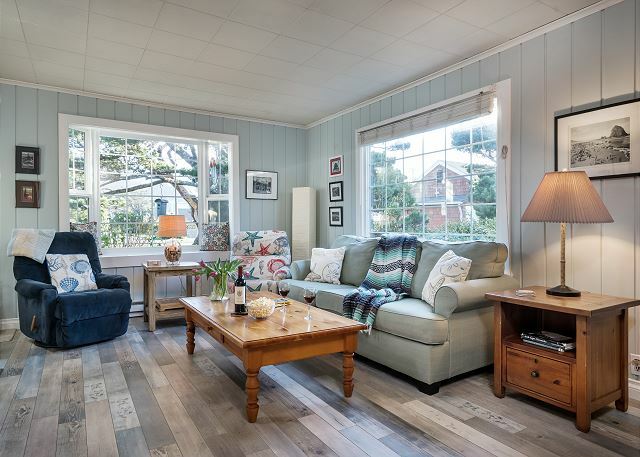 The Beach Pines Bungalow was the perfect setting. 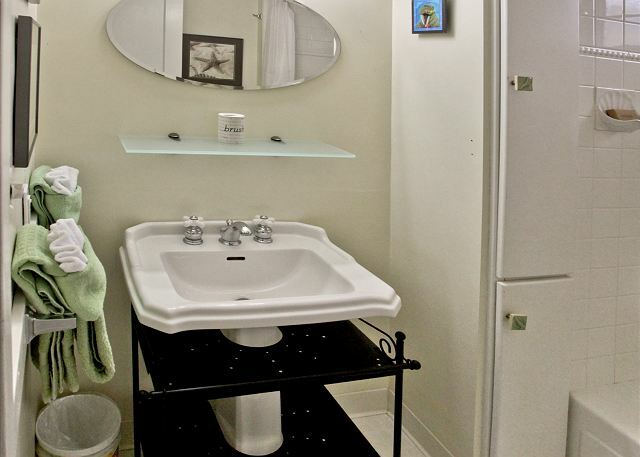 The house is the right size for a small group, very comfortable and well maintained. Really liked the deck, great place to relax and be social. We will be back for sure! 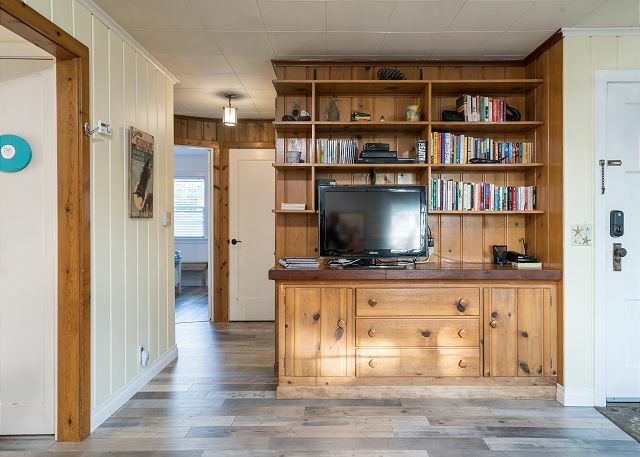 Reasonable cozy bungalow with everything you need. 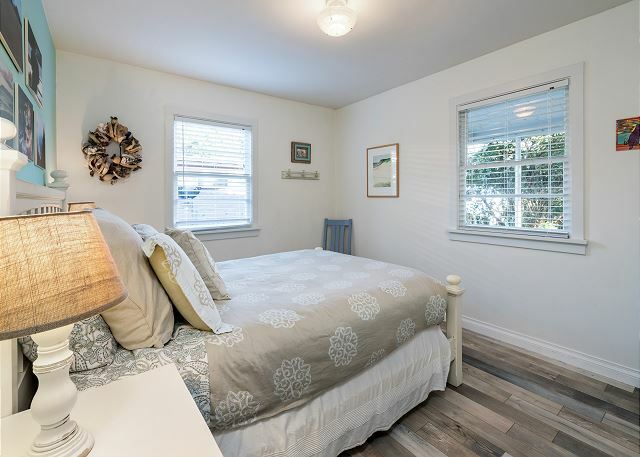 This was the perfect home for a ladies get together: it was clean, comfortable, good beds, and close to beach, trails, and shopping. All instructions were good and communication was excellent. We had the best time and would come back.